I used to joke that if I wanted to change careers, I could become an interior decorator for extremely patient clients. I could look at every towel rack in a three-county area before choosing one. Sometimes I have a problem being decisive. I love lasagne. But I hardly ever order it in a restaurant, because I’m always disappointed. It never comes out of the kitchen the way I think it ought to. I’m looking for thick, sturdy layers of noodles and fillings and cheese—the important word being sturdy. I expect it to have the structural integrity of a slice of cake, not a messy plate of pasta. Similarly, I love apple fritters. 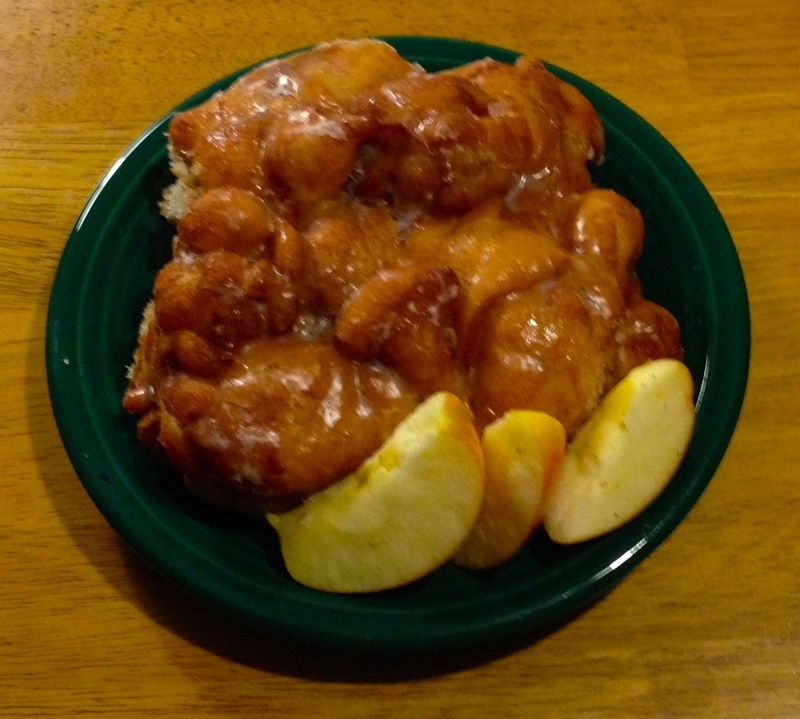 Or, at least, I love the idea of apple fritters. Chopped apples, held together by a little dough, fried and lightly glazed. On those rare occasions I go to the donut shop, I choose one, thinking, this will be great! And better than just a donut. What do I get? A pile of glaze-covered dough, in which you’d need a geiger counter to find the apples. Or, if I’m lucky, a gloppy spoonful of canned apple pie filling. I have no problem with a nice glazed donut. I like apple pie (though I’d prefer the filling not come from a can). But that’s not what I’m looking for. Pre-heat a waffle iron and coat lightly with non-stick spray. Set a cooling rack over a section of the newspaper you weren’t going to read anyway. Spoon the mixture, which will be thick and chunky, into the waffle iron and bake until golden brown and immensely fragrant. Remove each Decisive to the rack. If you want the glaze to set up, beautiful and shiny, wait ’til the Decisives are cool to apply it. We chose not to wait that long. It is possible that the lasagne I’ve been getting in restaurants is exactly as it is meant to be, and the stuff I make is the casserole of a Philistine. It is possible that a Fritter is supposed to be a fried lump of dough faintly smelling of apple. I don’t care. It might take a while for me to pick a towel rack, but when it comes to Sunday breakfast, I’m being decisive.